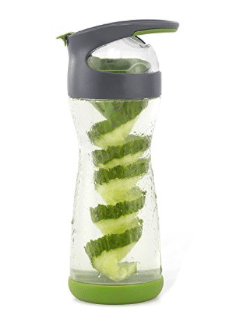 Amazon has a 15% off coupon on this Full Circle Cucumber Water Infuser Bottle. Most infuser bottles are made of plastic, so I’m excited to see this Full Circle bottle is glass. It’s currently marked down to just $17.29 (reg. $20), so with the 15% off coupon, this brings the price down to just $14.69. This is a great way to enjoy flavored water on the go while absorbing the vitamins of the cucumber in the water. There’s also a 15% off Full Circle Citrus Ice Cube Infusion Sets on Amazon you can check out here. PreviousPrevious post:HOT! Campbell’s Well Yes! All-Natural Canned Soup $.68 after Coupons- Stock up or DonateNextNext post:Rare $1 Stonyfield Organic Yogurt Coupon- Print Quickly!